Darc Marc Black IPA (7.3% ABV): Darc Marc is a Black IPA, a style I haven't seen brewed in a gluten-free version before. The style combines the roastiness of a porter with the hoppiness of an IPA. Darc Marc does a great job representing the style: dark caramel notes with a hop bite. Great amount of fluffy head on this one. The bitter/sweet combination of the beer will pair well with barbequed ribs. Buckwit Belgian (4.75% ABV): A cleverly named beer brewed in the style of a Belgian Wit. 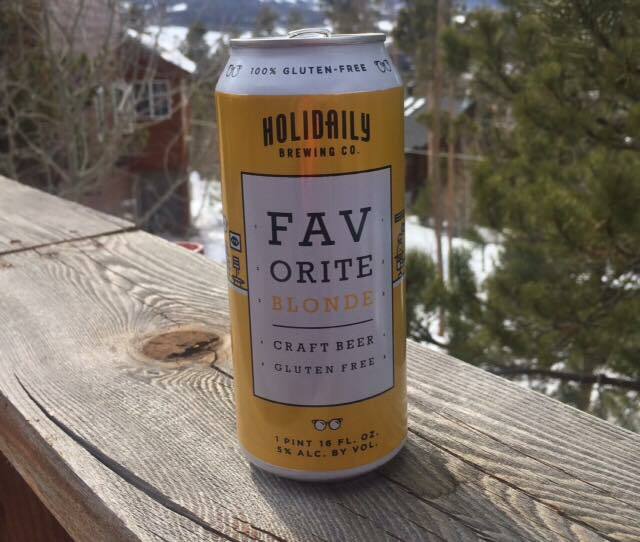 Instead of brewing with wheat, Holidaily uses buckwheat to give this beer its backbone and appearance. Spicy orange and banana flavors really come through. Pretend you're in Bruges and pair with some mussels or some pasta with seafood. 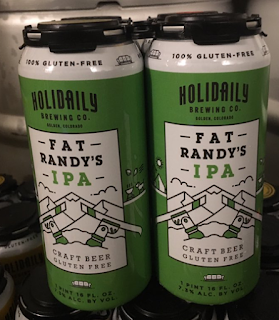 Fat Randy's IPA (6.5% ABV): This nicely balanced American style IPA, which is being canned for the first time this week, is not overly hoppy and has essences of tropical and citrus flavors. This is a crisp and refreshing brew. Try this one with your favorite pizza. Day In, Day Out Imperial Stout (10% ABV): I was pleasantly surprised to see that Holidaily decided to tackle a heady beer like an Imperial Stout, one of my favorite styles before going gluten free. Traditionally brewed, the imperial stout is big in alcohol, flavor and color. Day In, Day Out doesn't disappoint with big smoky roasted chocolate flavor, dark color and hefty ABV. Enjoy this with some flourless chocolate cake or other rich dessert. 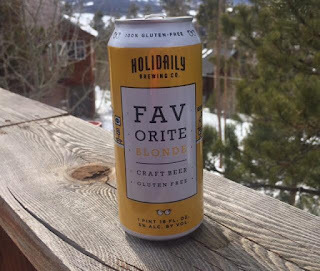 Many of Holidaily's beers can be enjoyed in the brewery taproom in Golden, while the Favorite Blonde is sold in cans throughout the greater Denver area.